TUALATIN, OR…Cascade Architectural, the international leader in the design, engineering, manufacturing, and installation coordination of coiled wire fabric systems, recently provided a near 4,000 sq. ft. of ¼” 16-gauge stainless steel fabric for the new parking garage on the campus of HCA Healthcare. 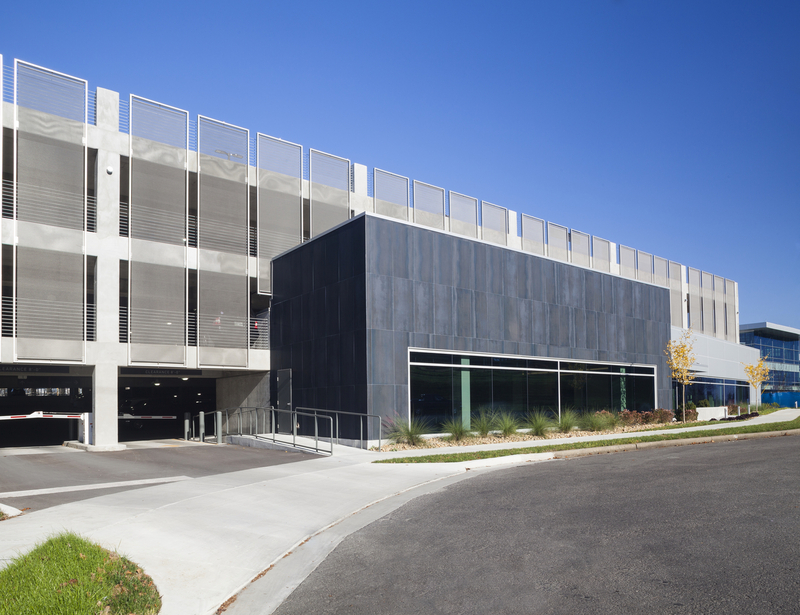 For this project, coiled wire fabric is relied on to define the architectural style of the parking garage. It conveys a clean and modern aesthetic – fulfilling the requirements outlined by the project team and the city of Nashville. The site of the HCA Building 4 parking garage is in an urban overlay zone – requiring the building’s design to abide by a specific set of urban overlay standards. 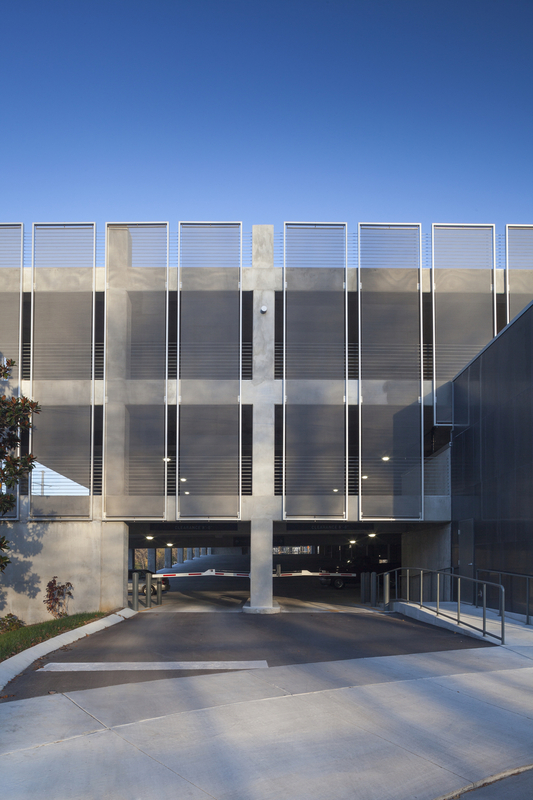 These standards required that the parking garage have an articulated façade to minimize the visual impact of the structure and add life to the street. Collaborative Studio, in need of a product with enhanced design features, called upon Cascade Architectural. Cascade’s solution is Fabricoil® coiled wire fabric secured in its Borderline attachment system – a perimeter only, powder-coated carbon steel frame featuring top and bottom rods that tension the fabric. Cascade expertly tensioned each panel – ranging from 19’ to 28’ tall – at its headquarters in Tualatin, Oregon before shipping them to Nashville, Tennessee. 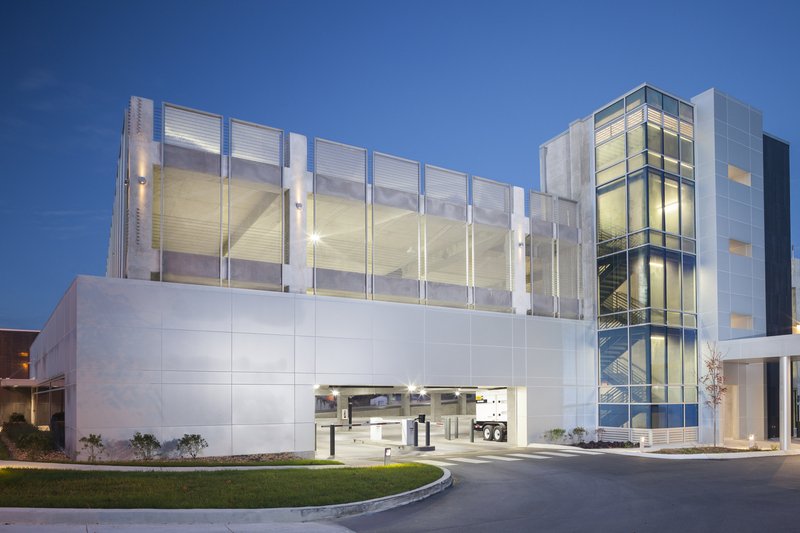 The other buildings at HCA have visually appealing exteriors; and Fabricoil® is a means of providing a matching aesthetic for an otherwise standard, pre-cast concrete parking structure. Compared to other exterior cladding options, Fabricoil® is an affordable design solution with exceptional functionality. 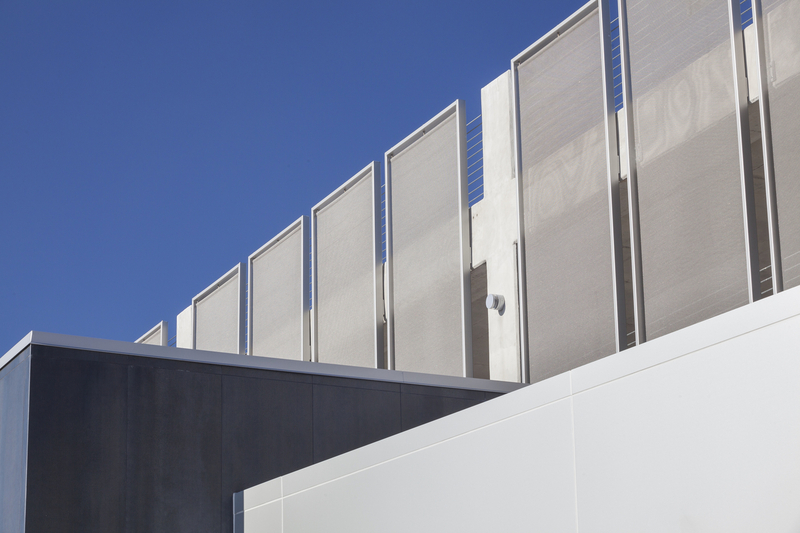 Fabricoil® is simultaneously open and closed – providing a barrier that gives occupants visibility out, provides fall protection, and allows ventilation throughout the garage. Cascade was brought in after the initial design phase when the project team was looking for an enhanced design element to clad the garage. They needed an innovative solution from a company that could offer a quick turnaround on a structure that was already fully designed. Cascade was able to promptly assist by working closely with the design team to manufacture and deliver the material under a tight schedule. 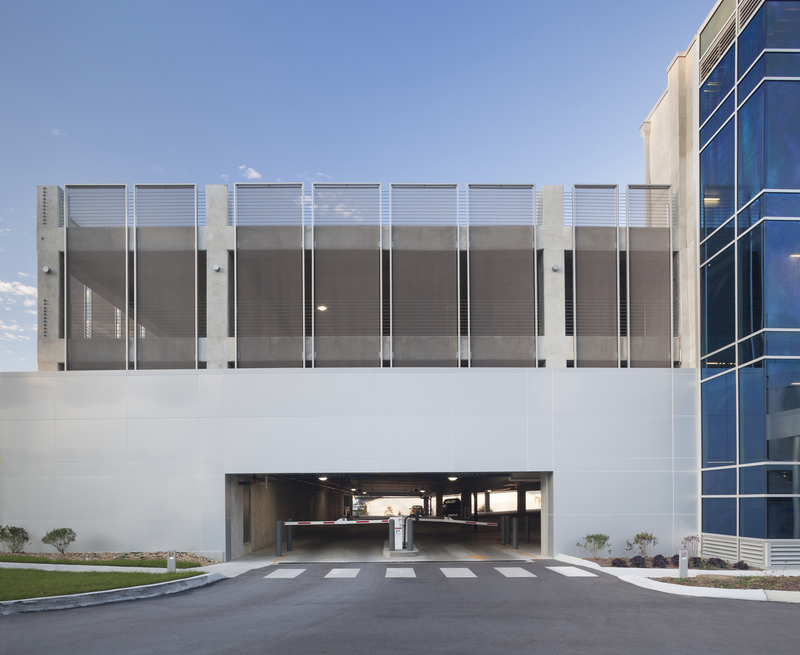 “The design included an upgraded façade for the garage, and Cascade provided a turn-key solution that aesthetically achieved the design,” says Virginia Campbell, Design Principal at Collaborative Studio in Nashville, TN. Cascade’s technical team pre-engineered the Borderline attachment units so that they could be bolted directly to the concrete of the garage upon delivery. The fabric is tensioned within the frame, resulting in a dead load, and eliminating the need to add additional supports to the existing structure. The unitized system afforded the installer and general contractor a much faster installation, saving time and money. “The Cascade team was instrumental in the design phase to assist with developing a design solution to meet our budget,” adds Campbell. Fabricoil® is manufactured in a wide variety of gauges, weaves, and color options. Campbell had used it in the past for interior applications but had not yet specified the material for exterior use. 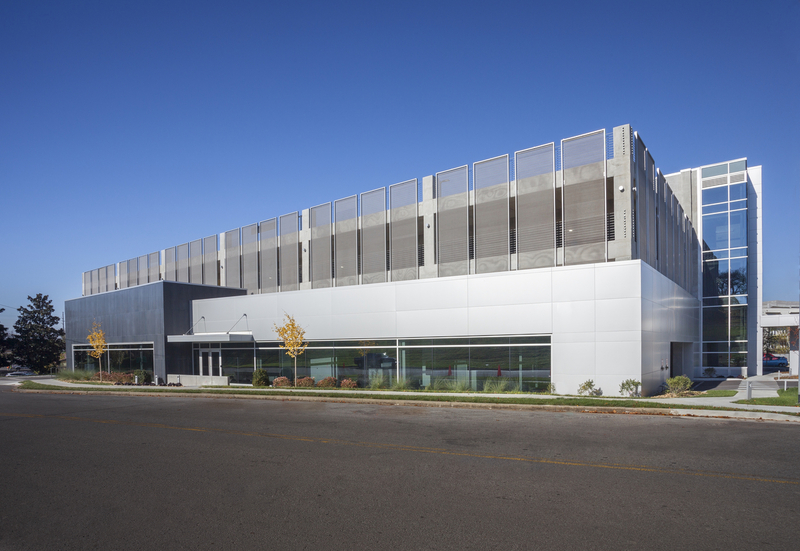 With help from Cascade Architectural, the design team specified stainless steel Fabricoil® – an affordable, low-maintenance material that is highly resistant to corrosion and oxidation. This phase of the HCA redesign was completed in August 2017. In addition to Cascade Architectural, the project team included architecture and design firm, Collaborative Studio LLC; and general contractor, JE Dunn Construction. 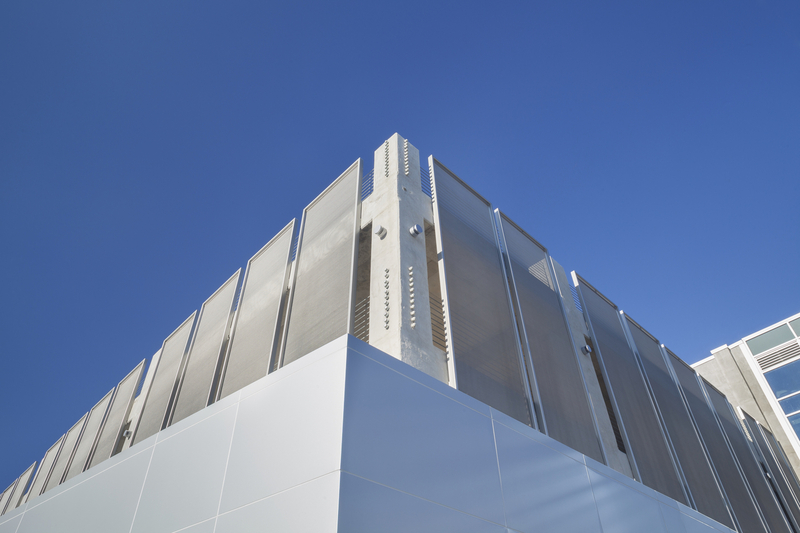 Cascade Architectural systems were specifically created to deliver design and functional performance for a variety of building applications. For more information, visit www.CascadeArchitectural.com. About Cascade Architectural: Cascade Architectural is a division of Cascade Coil Drapery, Inc., based in Tualatin, OR, the world’s leading manufacturer of coiled wire fabrics for a wide variety of applications. Cascade Architectural provides Fabricoil® architectural coiled wire fabric systems and their engineered attachment systems used by architects and designers around the world. In addition, Cascade Architectural also provides GuardianCoil® systems, engineered for security gates. Environmentally sustainable and made in the USA, Cascade Architectural’s coiled wire fabric has also been scientifically proven to save energy and increase thermal comfort when used as window treatments or exterior shades and scrims. For more information, visit: http://www.cascadecoil.com.